The first race is already done!! An open sea, 25km crossover, from St. Barth till St.Martin. 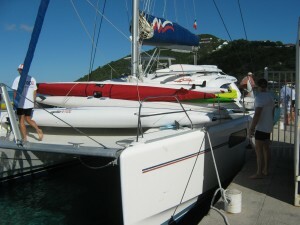 At sun rise around 6am the last details were arranged, followed by a 2 hours ride in a big catamaran to St. Barth. During the trip we could see that the swell wasn’t as big as expected and also the wind wasn’t blowing really strong, but the swell was still there. The arrival to St. Bart was amazing, nice and clean water, around 25ºC, air temperature rising up till 30ºC and a beautiful bay around. The race started around 9:30 and right in the beginning four paddlers took the lead, going with a good rhythm to the hotspot 9km away, where Tommy Karls from Sweden got in first. After the hotspot things got harder with the swell and wind coming from the side and the warm weather started to cause some difficulty to the athletes, but there were some fast runs reaching 17km/h and allwing a final average of around 13km/h. The first athlete to get into the finishing line was the Portuguese and also Nelo Staff Henrique Silva with in 2h00m34s followed by Frank Fillis from Guadalupe and in third place Tommy Karls from Sweden. Now is time to set up everything for a12 hours catamaran journey till Antigua where will take place the next race.